*We can arrange your transfer to and from Corfu aiport or port. The service is available from 06:30 to 00:00. From 06:30-22:30 5€ from/to port/airport. From 22:30-00:00 10€ from/to port/airport. For 1 night stays the cost is 10€ from/to port/airport. *Quad/4-Wheeler Safari - Take the Quad Safari, led by our experienced staff member. Go and visit the monasteries, quaint villages, remote beaches, mountains and historical southern parts of the island, the lake and play around on the natural sand dunes. The best way to explore this green and popular Greek island on land! *Kayak Safari and rentals - Go kayaking to discover the sandy, secluded nearby beaches and caves. Try taking a snorkel along for the underwater experience. Come on a Kayak Safari adventure with one of our talented staff where we visit a deserted island, a monastery, go cliff diving, play games, go snorkelling and lunch is provided! Or if you want to explore the island at your own leisure we also do single and double kayak rentals. It’s a great sightseeing day out with exercise and fun included discovering the enchanting western coastline. *Bars and nightclub - You can join us every evening to party the night away in our free nightclub and bars. The entertainment starts to build straight from dinner and continues until the early hours. The entertainment is different every night and our themes include traditional Greek nights (with dancing, plate smashing and ouzo), karaoke, toga parties, quiz nights, competitions and much more. We have four bars; roof-top, reception/cocktail bar, beach bar and nightclub bar. They all differ in terms of atmosphere so feel free to choose the one that suits you best on each occasion. An extended happy hour across the bars will ensure your enjoyment while staying on budget because the happy hour comprises a large selection of cocktails and drinks including pints of beer at only two euros. If you are not into partying don’t worry our nightclub is away from the hotel and is soundproof. We take care of the necessities for you with laundry service, convenience store, vegetarian meals and free internet access. If you’d like to upgrade your room when you arrive or extend your stay for as long as you wish it’s no problem. It was overall great. A definite stay at cheap price. Can only recommend staying at the Pink Palace! We were there still in the "off-season" and had a great time. The staff is wonderful, so friendly, lots of facilities available for use, great value for money! Always love staying here. Great scenery, always a lovely vibe even if it’s quiet. Rooms are small but clean and all have a terrace! We booked for 2 nights and ended up staying for 6. This place is unlike any other and we met the most incredible people. The wifi doesn’t work in any of the rooms but not a huge deal, the staff members are incredible.. just one lady could use some time off and a happy pill. Highly recommend - it’s a home away from home. The food is also like the last supper every single night, you will never starve here and your taste buds will jump for joy. The pink palace will literally change your life! Pretty cool place to stay, very nice rooms, very quick walk to the beach, it feels like you are at a resort. FYI if you book through the website, that price does not include the breakfast and dinner. If you don't go in peak season, which is April to September, the hostel is pretty dead and the club isn't open. There was also maybe one restaurant open and not even an ATM around, since the Pink Palace's card machine was not working. Overall, a nice stay. Room was clean when we arrived. We stayed 5 nights and the room was not cleaned once therefore the floor was covered in sand and dirt from outside. They will try to charge extra for everything- do not buy bus tickets here it’s a rip off. Since it was winter, there are no stores open nearby so you are forced to buy and eat at the hostel. The card machine was not working so you had to pay for everything in cash which was very inconvient. 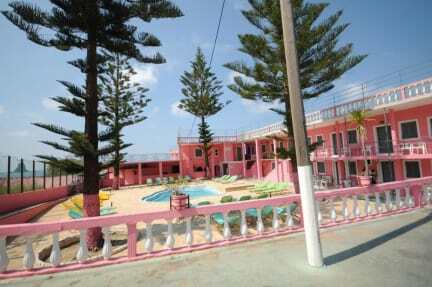 The pink hostel is in pretty location by the sea. Most of the stuff (guy who knew Prague) was good and helpful. The big minus is blond hair lady at reception. Such a person should not work in a customer service at all. Very rude and grumpy. Her language like "Michaela, come here" - make you feel like a dog. Me after asking if the bus back to the airport is free as the pick up her answer "no way" in very arrogant tone was a bitter end for me. That was the worst receptionist I have ever seen.